Philip Ashley’s older cousin Ambrose, who raised the orphaned Philip as his own son, has died in Rome. Philip, the heir to Ambrose’s beautiful English estate, is crushed that the man he loved died so far from home. He is also suspicious. While in Italy, Ambrose fell in love with Rachel, a beautiful English and Italian woman. But the final, brief letters Ambrose wrote hint that his love had turned to paranoia and fear. Now Rachel has arrived at Philip’s newly inherited estate. Could this exquisite woman, who seems to genuinely share Philip’s grief at Ambrose’s death, really be as cruel as Philip imagined? Or is she the kind, passionate woman with whom Ambrose fell in love? Philip struggles to answer this question, knowing Ambrose’s estate, and his own future, will be destroyed if his answer is wrong. A very enjoyable read from start to finish. I cannot believe that this book was originally published in 1951! I read Rebecca ages ago and loved it but I had never even heard of My Cousin Rachel until just a few months ago. I’m so glad I did. This is one of those stories where you sort of know how things will play out, but you continue to turn the pages because the characters are so richly drawn and the evil is almost too subtle to pick up that you feel the need to really focus on every line as some little clue might pop up. I just love these types of stories. Philip is so utterly taken with Rachel that he is incredibly frustrating at times, but the dynamic between to the two characters is so tightly wound, that you just expect him (or her) to snap at any moment. The descriptive details of the estate itself were quite well written. I felt as if I were walking the grounds myself at times. In the end, it was an incredibly satisfying read and if you haven’t read it, I highly recommend that you pick up a copy soon. I also cannot say enough about the cover of the re-release. It’s stunning. I won this copy over at Peeking Between The Pages. Thanks Dar! I haven't read any of du Maurier's work because I thought it was "heaving bosom" romance for some reason. After the great reviews I've read, I'd like to try one of her books. Oh man, now you've really made me want to read it. It sounds great. I'm glad you enjoyed it so much Ti. I haven't read any of her work yet, but I have won a copy of Frenchman's Creek so I do have that one on my shelf. Hopefully I will be able to read that one soon. Thanks for the great review! Nice Review. I think this one is on my future list for sure. 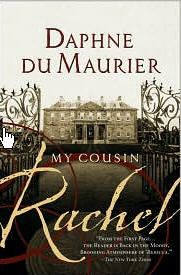 I have been wanting to read du Maurier. I've only read Rebecca and not in a really long time. This review makes me think I need to pick one of them up. Also, the cover reminds me of a Julie Garwood (heaving bosom, kathy, sorry) cover, but I am too lazy to go figure out which one. I only first heard about Daphne Du Maurier a couple (maybe three) years ago. I've been wanting to read this one as well as another of her books ever since. I am glad to hear you enjoyed this one, Ti. Great review. Great review! I've only read Rebecca, and this is already on my wish list. Great review, Ti. I haven't read any of her work either, but have been wanting to read Frenchman's Creek and now, thanks to your review, this one! Like Kathy, I thought they were 'heaving bosom'! (I love that description – I completely stole that from her! )lol I'm adding this to my ever-growing list! Hope you're enjoying the 4th!